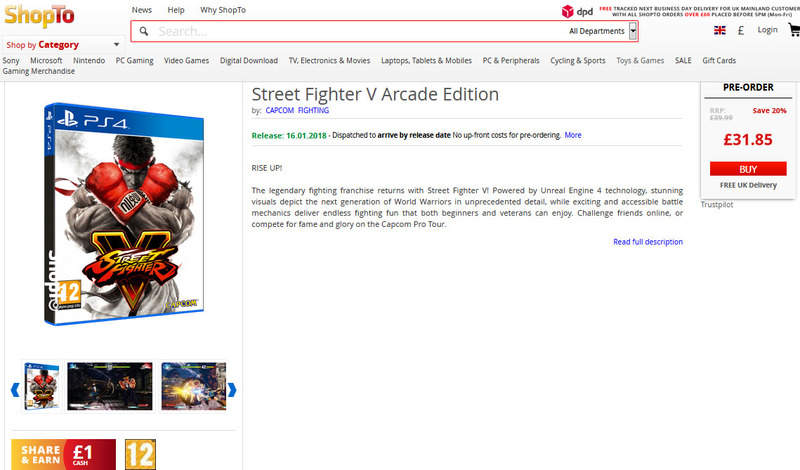 A retail listing for Street Fighter 5: Arcade Edition was briefly available online this week. It seems you can’t go a day without seeing a new, unannounced version of Street Fighter show up on some retailer’s website. After more retailers jumped on the Street Fighter Anniversary Collection bandwagon earlier this week, we now have another SKU that’s not been officially announced. This time it’s about Street Fighter 5. UK retailer ShopTo briefly had a listing for Street Fighter 5: Arcade Edition (dead). Spotted by NeoGAF, the listing was priced £31.85 and had a release date of January 16, 2018, which happens to fall on a Tuesday. Granted, Tuesdays are usually release days in the US, but ShopTo is not a retailer that’ll typically post fake games. It’s possible the game is releasing worldwide on a Tuesday, as so many games do. What’s interesting here, though, is that this is TGS week. It’s very likely, if Capcom is really sitting on Street Fighter announcements, that they will be made at the Japanese show. The product page did not provide any specific details about the Arcade Edition, but it’s not hard to imagine it including all previously released DLC and updates in one package. Street Fighter fans have called for the game to have a new launch in the form of an Arcade or Ultra edition that corrects the mistakes made with the initial launch. Seeing as all content is digital anyway, and Capcom promised not to segment fans with various releases before, it’s very possible this Arcade Edition is a real thing we’ll be hearing about soon.